Q: Is Ediniya result of the natural evolution of humanity, or a plan for Higher Powers? A: Both are true assumption. Evolution does not occur spontaneously, it is always directed by Over. The idea of creating Ediniya - not human effort, is a global idea, which is framed in the information form comprehensible to people's consciousness. In the future, on the whole Earth will be only one country - a higher plane, that nothing can stop them. Q: Can any great spiritual organizations, communities, unions, etc. pour into Ediniya and unite with her? A: This can not be done at the level of social associations. Ediniya - is a matter of private, on a personal level, and making each individual a conscious decision to live in it. No it does not come - it can only live and enjoy the fullness of life, free from all old. Q: In Ediniya will only live people or animals, too? A: Currently, only people do not live in Ediniya. Q: I have a car, using it as personal transport. Car pollutes the Earth's atmosphere. Can I be a citizen Ediniya? A: Only if you use the car as a necessity. Q: How often can I enter and exit Ediniya? A: There are no limits. Abide by the Constitution - live in Ediniya, if not - it will automatically leave it. But you must understand to become a resident Ediniya - need to consciously want it. If you are acting in the mode: left-entered, again out-come based on a whim, then this process can not be conscious. Q: The implication is that Ediniya, uniting all, destroy also all the ethnic culture? About: Ediniya nothing kills. It gives instead of separate ethnic cultures - the original culture from which they were formed. Q: It seems to me that I was not good enough to understand the fourth paragraph of the Constitution Ediniya. ABOUT: Suffice it to say during the day once myself (mentally) consciously and sincerely: "I live in Ediniya and wish you love, happiness and perfection of all its inhabitants!". When you say this phrase, then think of a single country on earth and its inhabitants. Q: On the earth live still other forms of life that are unknown to scientists. This is a conscious and intelligent beings who have maintained their populations deep within the oceans or mountains. Will they also live in Ediniya? A: A perfect beings will move to a higher level, those who will be at the level of people - will live together with people, not hiding its presence. Q: What else can I personally do for Ediniya? A: Inform the people, tell them about this unique country. Q: I am a Muslim, Christian, Buddhist ... Can I become a citizen Ediniya, continuing to practice their religion? A: Anyone can become a citizen Ediniya and live in it if it complies with its Constitution. In the Constitution there are no restrictions on religion. You can continue to practice and follow your desired religion without restriction. Q: If I buy shoes from leather, use leather gloves and wear a fur hat, this is a violation of the Constitution Ediniya? A: You can buy all these things, if there is no other alternative. Q: Why create a new country on Earth, is not it better to combine the existing one? About: Ediniya fundamentally different from territorial countries. Ediniya not "created", she already was, but for now just appears to people. It can be attached only to the planet Earth as a cosmic body of the universe. You can not point to some mountain or some plain and say it Ediniya. Ediniya - it is always full and whole, indivisible and unifying the whole Earth. 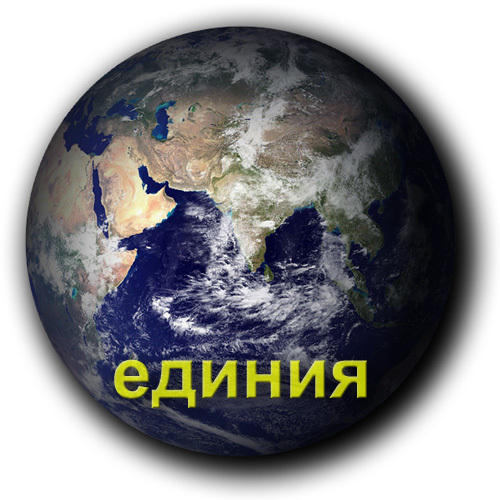 Ediniya and Earth - is one. This is not the result of combining any social survivals, is a result of the unity of all people of Planet Earth. Q: I still can not be a citizen Ediniya, I do not have the forces to carry out all the paragraphs of the Constitution, but I am wholeheartedly with you. Can I perform meditation, which is done every day, residents Ediniya, wishing them happiness, love and perfection? Q: Those holy and committed people who are now living on Earth, is automatically included in Ediniya? A: Ediniya nobody comes automatically, but consciously. Q: How should I understand the fact that such a flag is already owned by several organizations in the world? About: Ediniya does not claim to possession of a rainbow or a property right to it. Rainbow - is that it can be seen all over the sky, this beautiful natural phenomenon after cleansing and refreshing rain. Q: What exactly is meant by the pollution of land, rivers and air? A: This is the fourth paragraph of the Constitution Ediniya: "Residents Ediniya should not cause any harm to the earth." This includes all chemical wastes, toxic gases (such as from cars, factories, etc. ), different deforestation, destruction of flora and fauna, creating fires, etc. Q: Does Ediniya any relation to the Biblical prediction of the salvation of 144,000 people, which is described in the "Apocalypse"? A: It is, but do not hold any analogy with the information that distort over a long period of time. Q: How soon I will begin to reveal secret knowledge and ability, after my arrival in Ediniya? A: Not immediately. This will happen gradually, as the growth and strengthening of this country. Q: The Constitution Ediniya nothing said about the ban on alcohol, drugs, lying, debauchery ... All of these things resolved? A: In the fifth paragraph of the Constitution Ediniya said that residents Ediniya strive for excellence and fulfill any, at their discretion, the spiritual practice. Enough to strive for excellence. Q: Still not clear why the flag is a relic of the spirit of conquest, and the flag does not count? It is known that the flags going on all the major military conquest. A: Coat of arms - it deliberately created the heraldic symbols of a state, in order to create an awesome image of strength and power. They appeared during the war, during the spirit of conquest and subjugation of man by man. Flags - this phenomenon is very ancient, and its roots from the days when people still did not know about war and bloodshed. Flag Ediniya - a heavenly rainbow.